Moving is one of life’s more stressful activities. 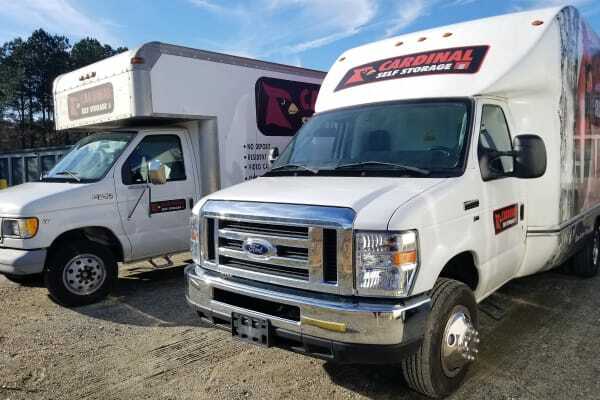 At Cardinal Self Storage we understand and aim to take some of the pressure off by offering a free moving truck to customers who rent a storage unit. We provide a moving truck to save people the bother and expense of renting a vehicle from another company, making multiple trips in a car or begging a favor from a friend with a pickup truck. The free use of a moving truck is an example of our dedication to customer service. We believe, too, that a good vehicle will provide the safest ride for your cargo. Rent your next moving truck from Cardinal Self Storage - Graham. Whether you need to move across town or across the state, we have the right size truck for your needs. Simply get in touch with our leasing office to learn more about our policies regarding Graham truck rentals. Ready to reserve a storage unit or moving truck? Contact Cardinal Self Storage - Graham today.